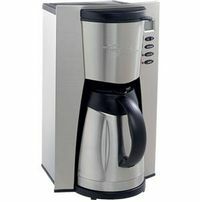 I found a number of posts about the Starbucks coffee makers on coffeegeek.com, and a couple other review sites. No really adverse opinions, and in general, a good solid machine that met the three requirements, and I could actually go to a store and see one. So, popped into a Starbucks and they happened to have a deal on a Barista Aroma Grande coffeemaker. I’ve known that freshly ground coffee was the best, and learnt that those little blade grinders are not the ideal – and discovered a great deal at Superstore for a little ceramic burr grinder for only $30. Picked it up and went by St. City Roasters for some more beans to test out the new little grinder. After a month or so, I’ve put about 5lbs of coffee through the grinder and coffeemaker, and have been very pleased pot after pot. I had to pick up a Thermos to empty the carafe into in the morning, so that I could enjoy the coffee at work instead of wasting anything from my morning pot.